Meanwhile, one current player feels the German would an ideal fit for Liverpool. 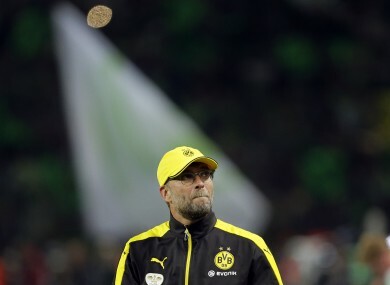 Former Borussia Dortmund coach Klopp is favourite to take over at Liverpool. LIVERPOOL DEFENDER EMRE Can believes Jurgen Klopp has the potential to be a success at Anfield, while reports today suggest Liverpool hope to have the German installed as manager by the end of the week. Talks between the two parties are understood to be progressing well, with Liverpool thought to be keen to have a new boss in place prior to their next Premier League game against Tottenham on 17 October. Brendan Rodgers was sacked on Sunday following a stuttering start to 2015-16 and a previous campaign in which the Reds finished sixth, 25 points behind leaders Chelsea. Speaking before Rodgers’ sacking, Emre praised Klopp’s work at Borussia Dortmund, whom he led to two Bundesliga titles and a Champions League final prior to his Signal Iduna Park departure this summer. “Jurgen Klopp is certainly a great coach,” the former Bayer Leverkusen player, 21, told Die Welt. Emre has been deployed primarily as a centre-back this season, with Rodgers choosing to field a three-man back-line, and suggested that the players also had to take some responsibility for their hit-and-miss form. “We had a dip in form at Liverpool for a few games, which has cost us,” Emre added, who subsequently was at fault for Everton’s goal in Liverpool’s 1-1 draw that proved to be Rodgers’ final game. Can also spoke of admiration for former Liverpool captain Steven Gerrard, who moved to MLS with LA Galaxy at the end of the 2014-15 season. “I remember a moment when we were on the bus, focused on a match against Chelsea. I had been previously injured and had rarely played,” the Germany international continued. Email “Liverpool want Jurgen Klopp installed as manager by Friday - reports”. Feedback on “Liverpool want Jurgen Klopp installed as manager by Friday - reports”.